“Treat the Messiah as holy, as Lord in your hearts; while remaining always ready to give a reasoned answer to anyone who asks you to explain the hope you have in you —” (1 Peter 3:15). 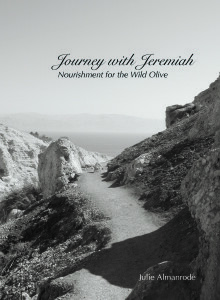 Journey with Jeremiah is a compilation of reasoned responses written to answer questions regarding a ‘gentile’ walk of faith in the Jewish Messiah of Israel. It will challenge a gentile’s spiritual attitudes and how they live out their love for the God of Israel and His Son, Jesus (Yeshua). It will move the non-Jew from a crossroads in their faith onto the ancient paths bringing nourishment to the wild olive. Part One explores many of the misunderstood doctrines in historical Christianity: the new covenant, the problem in Galatia, the law vs. the Law, Peter’s vision, and the timing of Jesus’ birth. Part Two brings the ancient shadows into the reality of Yeshua giving prophetic insights into the unexplained ‘Jewish festivals’ that leave holes in the pages of the New Testament. Part Three gives simple recipes, study guides and crafts to use when celebrating the Biblical holidays. Note: Purchases are made through CreateSpace and Amazon.com with a credit card. If you need to purchase through Paypal, please contact me directly: julie@tentstakeministries.